UPDATE (3/31): Chen-Jung (Jennifer) Robinson’s funeral will be held Saturday, April 2, 2011, from 1:00 p.m. to 2:00 p.m. A viewing will be held immediately following, from 2:00 p.m. to 3:00 p.m. The funeral service will be held at Sierra View Funeral Chapel at 6201 Fair Oaks Blvd., in Carmichael, CA, 95608. On Thursday, March 24, 2011, my mother Chen-Jung (Jennifer) Robinson passed away. She cared very deeply for the health and well-being of all of her clients and we are grateful she had the chance to help so many people. Helping people brought a great deal of joy to her life. Please say a prayer for my mom — it would mean a lot to myself and her. In the meantime, if you have any questions or concerns, you can contact her sons, Matthew and Ken. You can reach them through Ken’s e-mail at kenshen@ucla.edu. Her focus is on treating the whole person and eliminating the source of the problem, resulting in long term relief from symptoms. About Chen-Jung (Jennifer) Robinson, MS, L.Ac. I first became interested in acupuncture more than fifteen years ago. I was sick with asthma and looking for effective treatment as I was disappointed with conventional treatment of injections that were only making my condition worse. A friend from China suggested that I take an acupuncture class to learn more about it and see if it would help me with my problem. With my long term interest in martial arts such as Qi-Gong and Tai Chi, as well as in Chinese medicine, (I was born in Taiwan and came to the United States when I was 30) I decided to check in to it. I didn’t know at that time, that I was embarking upon my life’s work. In 1993, I attended the Academy of Chinese Culture and Health Science in Oakland where I received my M.S. degree in Chinese Medicine. 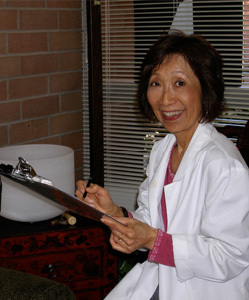 After graduating, I opened my clinic in Carmichael and have helped bring acupuncture to the Sacramento area ever since. I don’t have a particular area of concentration as that isn’t the essence of Chinese Medicine. Here we look at the whole person, the whole body, to find ways to restore balance to the system. I have genuine concern for people’s suffering and a deep desire to help them in the best ways I can. I constantly search for effective methods to restoring and supporting health and wellness, as I don’t want to be limited to using just one method. Detoxification, for example, plays such an important part in this process. People come across lots of pesticides as well as toxic chemicals from household cleaning products, and heavy metals from air we breathe, our water pipes and even from every day personal care products. The body is so backed up that the natural body can’t handle the load. Through detoxification, people report that they have a lot more energy and feel like themselves again. The certified organic skin care product line that I carry is wonderful for everyone, and very important for anyone experienced health challenges as the ingredients nurture and nourish the skin without the use of chemicals and additives. Our body absorbs significant amounts of what we put on our skin. With certified organic food rapidly becoming the nutrition of choice by health conscious people, why would we accept any less for our skin? Jennifer delights in discovering the most effective treatments for each of her clients. Please call her today for your free phone consultation. For contact information, click here. Serving the Sacramento area, including Carmichael, Fair Oaks and Roseville.